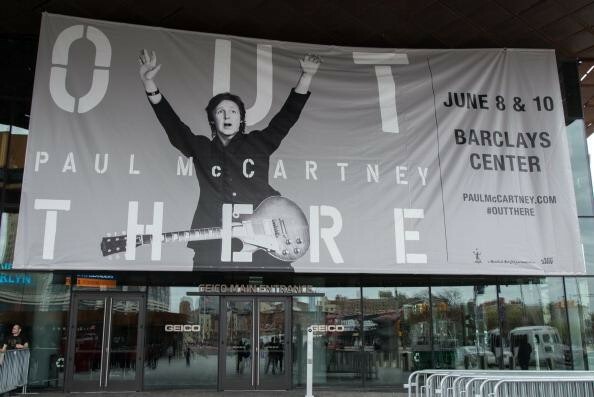 Originally expecting to be out of town for this event, plans changed & I needed to get McCartney tickets. After mulling over various ticket broker options, I went to ticketmaster & scored some excellent seats. Section 26 third row, right off the front left side of the stage. What a great view in a private little section of the arena. There were only three seats in our row two seats in the section next to us. 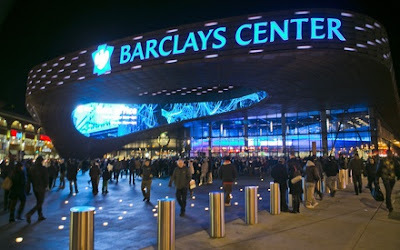 Barclays Center Review: As for the new Barclays Center, it is located in downtown Brooklyn, a busy area that is building up around the venue. It is a behemoth building that looks like it was just dropped from the sky, kind of ugly around the sides. I do like the front entrance which has an open rotunda looking up into the sky. Inside, it's an intimate venue if you're sitting in the lower sections of the arena. From there it looked like the second level seats were way up there, located high above the suites sections. The corridors are filled with concessions from many local Brooklyn vendors, notable Nathans, Juniors Cheesecake & Brooklyn Beer. Unfortunately there are just a few stand up tables, so not much room to eat unless you take it back to the seats. The seats were cushioned, with folding cup holders on each one. There was one higher end restaurant the 40/40 club in which I did not eat in. The corridors were wide but I thought had a very dark cold feel to them. I prefer Manhattan, with all it has to offer & I'll take Madison Square Garden over any place in the tri state area. One good thing is there are plenty of cabs after the show, that you can just hail right outside the arena. We actually had a Dial7 car service set up, but we cancelled when the driver called & wanted us to walk a block or two away in the rain to meet him??? Yellow cab was the way to go & much cheaper. 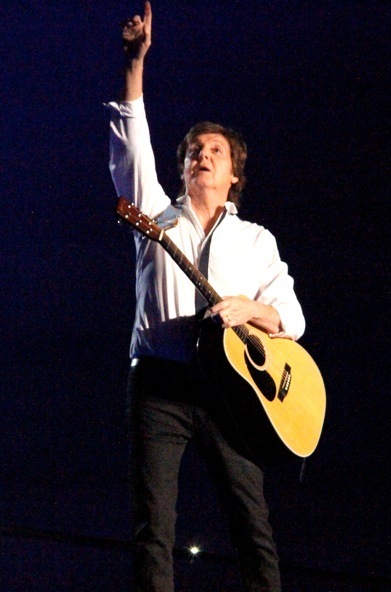 Concert Review: As for Paul McCartney, all I can say is the show was absolutely incredible. An almost three hour show that featured 38 classics with not one moment of down time. One of the best concerts I have ever attended, and I have been to many. It was also one of the best concerts I have ever seen Macca play & I have been to many. I still think the Citi Field shows may have been the all time best in 2009, but this was damn close. The man still has it, although not having the voice he had way back when, it has gotten much stronger than it had been in the nineties. He handles his vocals perfectly, from his high pitched screaming vocals to his soft ballads. At times he got help with harmonies from his band especially drummer Abe Laboriel, Jr. 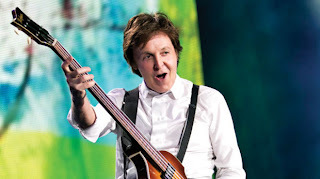 The multi talented McCartney played his Hofner bass, probably the most famous instrument in the world. He also played piano, organ, acoustic & electric guitars. I could go on forever about Paul's talents & accomplishments but I will just give a quick review of this amazing show. All I can say is amazing, fantastic & worth every dollar paid at any price level. I usually peek ahead at set lists before shows, but this time I wanted to be surprised, and I sure was. Talk about set list this was one of the best set lists ever! Right off the bat we got Eight Days A Week, Juniors Farm, All My Lovin & Listen To What the Man Said. Unbelievable. Other surprises to me we're Elanore Rigby, 1985, All Together Now, Lovley Rita, Ob-La Di Ob La Da & Being For the Benifit of Mr. Kite. 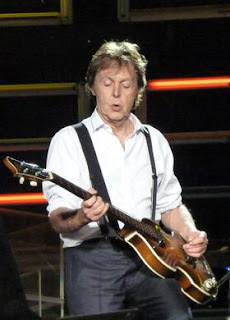 Although I am not too big on him covering pure Lennon songs like that one, or A Day in the Life & Strawberry Fields which he a has done on previous tours. But it does work & the crowd loves it. He blew everyone away with the first set of songs, including a Jimi Hendrix tribute, with the Foxey Lady intro to the great Wings song; Let Me Roll It. He then went up to the piano & played a song for his new wife, Nancy Shevell; from his last album; My Valentine. Paul stayed on the piano & broke into Wings 1985 (wow, outrageous)- The Long & Winding Road (also great) & Maybe I'm Amazed which he dedicated to Linda. He then picked up the acoustic guitar for a set that included Beatles classics; Things We Said Today, And I love Her &Blackbird. 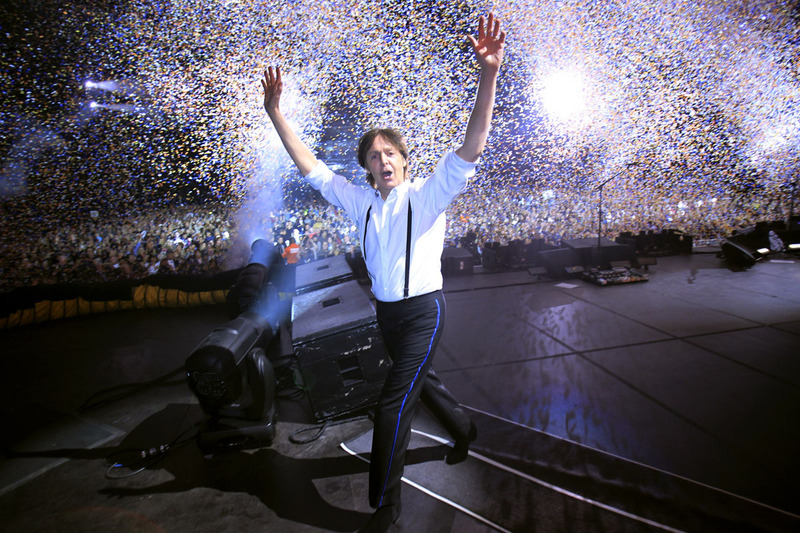 At this point Paul took a smaller stage that elevated him high above the crowd in front of the main stage. 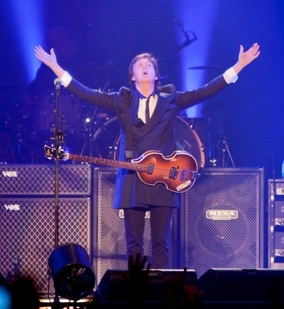 Paul also did his touching tribute to John, by doing the emotional; Here Today written after John's death. 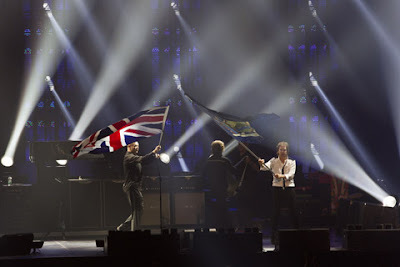 There were amazing, surprising performances of; Lady Madonna, Your Mother Should Know, All Together Now (which works so well in concert) & from Sgt. Pepper Lovely Rita!! A song he never played on tour before! 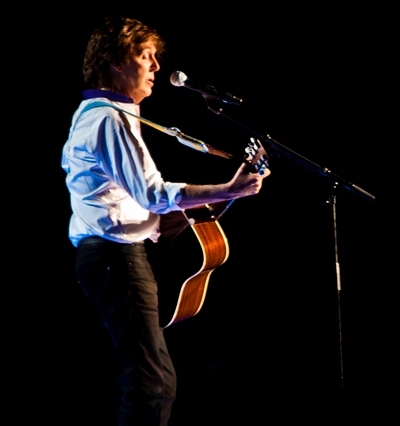 ﻿﻿Paul then did his touching tribute to George Harrison, playing George's classic; Something. The final set rocked out with Ob La Di- Ob La Da, a great cover of Band on the Run & an electrifying Back In USSR, followed by an explosive; Live & Let Die, complete with pyro technics. Sitting on the front side of the stage the explosions & the heat were incredible. Mixed in that set were two songs beyond classic; Let It Be & Hey Jude, complete with the Barclays Center on its feet chanting the "Na Na NA" parts. As the cameras panned the crowd during this segment, we noticed Martin Scorcese & Jerry Sienfield, just a few celebs who were in attendance. If that wasn't enough, encore #2 gave us Yesterday. 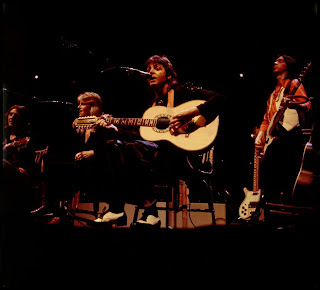 I always say; there is not a better moment in music than seeing Paul McCartney singing Yesterday alone with an acoustic guitar. 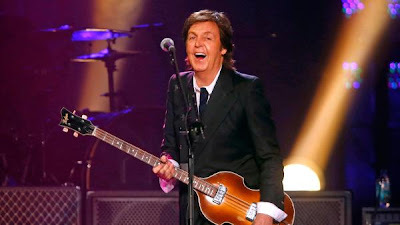 Only Paul could go from that to an explosive rocking out version of Helter Skelter, then ending with Golden Slumbers/Carry That Weight/The End. Although Paul's banter between songs was the usual for many years, has does do a better job interacting with the crowd. Macca has made parts of his show, into a remembrance's of important people in his life that are gone. His touching tributes to John, George & Linda all bring an emotion to the crowd. Since we have been following him, while living through the music ,we understand these relationships & what they meant to him, as well as to his songs. So in this connection, the audience too feels the losses, as if they were our own. It is also a forum to celebrate their lives & happy moments, albeit for one song, during these sets. Under everything, it's about the music, & Paul's music has been the soundtrack of our entire lives, probably more so than any other artist. This was for good & bad times in our lives. I think true Beatle fans understand what the Beatles music has brought to us. They have become one of our best friends, in a musical sense that no other artist can connect. At times the Beatle music has brought more inner peace in life than anyone or anything else. ﻿﻿During last nights concert, my own personal reflections were musically to John Lennon, (my all time favorite) & George Harrison (another top fav). But personally there were the songs like Long & Winding Road that make me reflect on my grandmother & the loss of a best friend as teenagers. 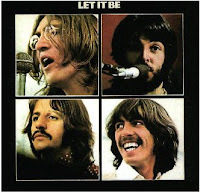 Let It Be, with Mother Mary (my mothers name as well) coming to me with word of wisdom. This is possibly my favorite McCartney ballad & the best single sentence, he ever wrote in terms of meaning to me is: "Shine until tomorrow". Everyone held their loved one a bit tighter during: And I Love Her, Maybe Im Amazed & of course Something, "our love" song in my personal relationship. 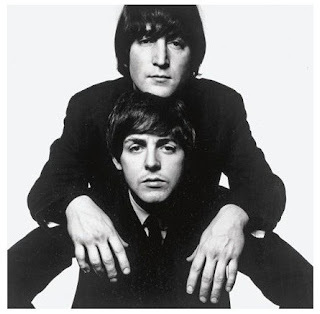 Other songs that connect the audience -All My Lovin, (my mother's favorite Beatle song) & words I always end my greeting cards with. The reflections of our own past on Yesterday, can humble anyone. The sad story of an ex girlfriend who lived the story of Another Day, or the Eleanor Rigby type woman, we all knew at some point. But even more so, there are the happy, positive, rocking good time songs, the good moments in life I shared with my brother & cousin as lifelong Beatles fans. My best friend Darren who got me into the Beatles when Wings were flying high in the mid seventies. We may still be the two biggest Wings fans in the world at this point! Even though we sat separately he was in the area last night with another dear friend Eddie, who I grew a close relationship with over the past quarter century through the Beatlefests. Paul's story of seeing Hendrix play Sgt. Pepper two days after the album was released, is now an old one but a good one. Many female fans, still bring signs to the concerts, just like in the old Beatles film clips. Paul commented on one sign that read: "Brooklyn girls do it 8 days a week" saying something like I'm not going to find out. 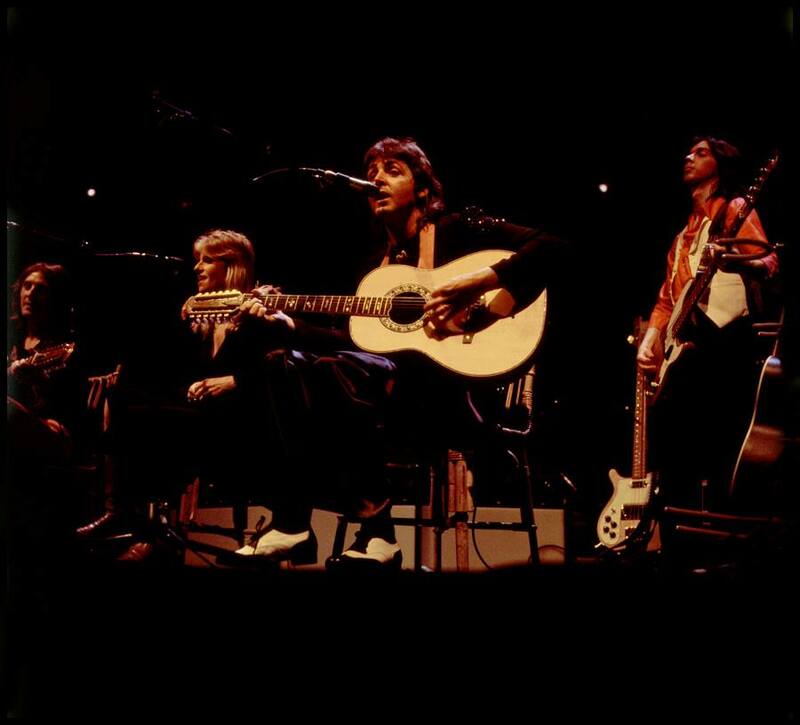 the band: Paul's band who has now been with him longer than any other ensemble in his career, imagine that! First off it features the great Abe Laboriel Jr. on drums. He also does an amazing job on backing vocals helping Paul on some more difficult numbers. The animated drummer is very animated & always fun to watch. On guitars/vocals was Rusty Anderson, who was on our side of the stage & very acknowledging to the crowd. On bass/ guitars/ vocals was Brian Ray & on keyboards was the great Paul Wix Wickens. Wix has been with Paul since the early nineties. All do an incredible job in keeping the Beatles/ Wings sound alive with perfection. I too was at the 2009 Citi Field concert which was amazing. Comparing this one as anywhere nearly as enjoyable is bizarre. This concert, which started an hour late and lasted closer to 2 1/2 hours, was mostly an assault on the senses. It was way too loud and extremely distorted on all but the softest numbers. There were a number of times I thought the vibrations that riddled my body were going to cause my heart to have an attack. This may very well be my last indoor rock concert. 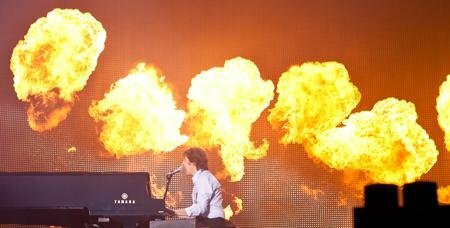 And whatever that was filling the first hour before Paul finally came on stage was even more of an assault on the senses.